If you are timid - put this book back on the shelf now! If you refuse to join the lemmings that are surging, mindlessly towards the edge of the cliff, then read! Also, if you're exhausted from "resumé-itis"; from endless interviews or from humiliating rejections, maybe it's time to try a new approach - try selling yourself into a job! Even if you're new at the job search game and your teacher, father, school chums, Great Uncle Fred, Aunt Sally and your pet parrot have all told you to write a resumé - then think again - there could be a better way that will lead you right into a job... no resumé... no rejections! After all - what is the employer looking for? He or she has a need (whether or not they are aware of it) and if you have the solution - you get the job... without a resumé! This approach worked for Dr. Ray Mesluk. It can work for you. Let him show you how. Dr. Ray Mesluk holds a Ph.D. in Mathematics from the University of Waterloo. After initially failing in his efforts to find employment, he learned and applied sales and marketing techniques to his job search. He then readily obtained positions, including that of branch manager for Adia, a leading recruitment firm. He knows the recruitment market well. This book will show you a novel approach that has worked successfully for him. It could work for you. Read it! Chapter 1 - Why a Sales Letter? Part 3 - What If You Need Extra Help? Chapter 14 - Do it Now! 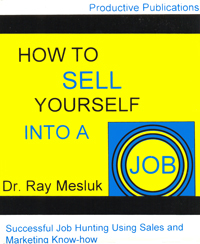 HOW TO SELL YOURSELF INTO A JOB - Successful Job Hunting Using Sales and Marketing Know-how by Dr. Ray Mesluk, 184 pages; ISBN 978-0-920847-91-6; softcover; published in 1995; Canadian $29.95.